The biggest and best art news in Washington this week is that the Phillips Gallery is open again and the new wing can now be seen. . . . Inside, the Duncan Phillipses have happily followed the most successful feature of the old gallery: comfortable chairs and tables, beautifully decorated rooms (the work of Marjorie Phillips) rugs in the floors and large ashtrays on every table, inviting the visitor to sit down and relax in a home-like atmosphere. The annex’s first iteration will live a relatively brief life, renovated in 1989 by Arthur Cotton Moore and Associates. 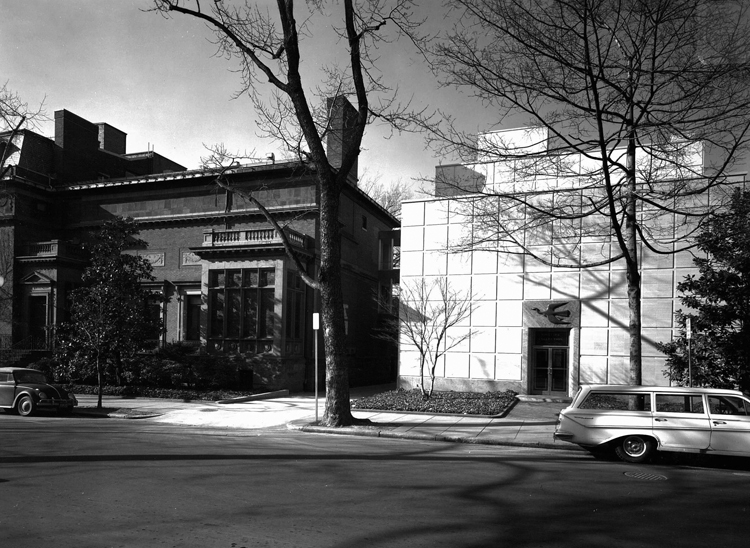 This entry was posted in Phillips Flashback and tagged 1960 Annex, buildings, museum architecture. Bookmark the permalink. Ashtrays ?!?! Good lord, people used to be able to smoke inside the gallery, with the paintings and artwork !? It’s true. People are often alarmed to hear this historical tidbit. Painter Richard Diebenkorn said in an oral history that he remembered coming here and sitting down and smoking in front of the paintings, feeling at home. The painters who painted these paintings smoked in front of them. Georges Braque, Nicolas de Staël, Arthur Dove, etc. In a museum it is the threat of fire and not the effects of cigarette smoke that are the threat. Certainly. Jackson Pollock’s Full Fathom Five even has cigarettes embedded in its surface. That’s right. And how many photos of Pollock in his studio do you see a cigarette dangling from his mouth? I saw Full Fathom Five years ago at the Jack Tilton Gallery in New York in an homage to Betty Parsons and carefully looked for those cigarettes and found them encased in enamel. I also met Nicolas de Staël’s son Gustave in Paris and we discussed his father’s paintings in the USA and how I first saw them in person at the Phillips Collection.